Star Explodes - Universe Galaxies And Stars Section. Star Explodes Inside Another Star. Artist's impression of the explosion of RS Ophiuchi. Image credit: David A. Hardy. Astronomers recently noticed that the normally dim star RS Ophiuchi had brightened enough to be visible without a telescope. This White Dwarf star has brightened like this 5 times in the last 100 years, and Astronomers believe it's about to collapse into a Neutron star. RS Ophiuchi is in a binary system with a much larger red giant star. The two stars are so close that the White Dwarf is actually inside the envelope of the red giant, and explodes from within it every 20 years or so. On 12 February 2006, amateur Astronomers reported that a faint star in the constellation of Ophiuchus had suddenly become clearly visible in the night sky without the aid of a telescope. Records show that this so-called recurrent nova, RS Ophiuchi (RS Oph), has previously reached this level of brightness five times in the last 108 years, most recently in 1985. The latest explosion has been observed in unprecedented detail by an armada of space- and ground-based telescopes. Speaking today (Friday) at the RAS National astronomy Meeting at Leicester, Professor Mike Bode of Liverpool John Moores University and Dr Tim O'Brien of Jodrell Bank Observatory will present the latest results which are shedding new light on what happens when stars explode. RS Oph is just over 5,000 light years away from Earth. It consists of a White Dwarf star (the super-dense core of a star, about the size of the Earth, that has reached the end of its main hydrogen-burning phase of evolution and shed its outer layers) in close orbit with a much larger red giant star. The two stars are so close together that hydrogen-rich gas from the outer layers of the red giant is continuously pulled onto the dwarf by its high gravity. 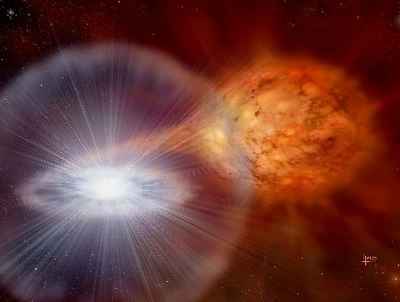 After around 20 years, enough gas has been accreted that a runaway thermonuclear explosion occurs on the white dwarf's surface. In less than a day, its energy output increases to over 100,000 times that of the Sun, and the accreted gas (several times the mass of the Earth) is ejected into space at speeds of several thousand km per second. Five explosions such as this per century can only be explained if the White Dwarf is near the maximum mass it could have without collapsing to become an even denser Neutron star. What is also very unusual in RS Oph is that the red giant is losing enormous amounts of gas in a wind that envelops the whole system. As a result, the explosion on the White Dwarf occurs "inside" its companion's extended atmosphere and the ejected gas then slams into it at very high speed. Within hours of notification of the latest outburst of RS Oph being relayed to the international astronomical community, Telescopes both on the ground and in space swung into action. Among these is NASA's Swift satellite which, as its name suggests, can be used to react rapidly to things that change in the sky. Included in its armoury of instruments is an X-ray telescope (XRT), designed and built by the University of Leicester. "We realised from the few X-ray measurements taken late in the 1985 outburst that this was an important part of the spectrum in which to observe RS Oph as soon as possible," said Professor Mike Bode of Liverpool John Moores University, who led the observing campaign for the 1985 outburst and now heads the Swift follow-up team on the current explosion. "The expectation was that shocks would be set up both in the ejected material and in the red giant's wind, with temperatures initially of up to around 100 million degrees celsius - nearly 10 times that in the core of the Sun. We have not been disappointed!" The first observations by Swift, only three days after the outburst began, revealed a very bright X-ray source. Over the initial few weeks, it became even brighter and then began to fade, with the spectrum suggesting that the gas was cooling down, although still at a temperature of tens of millions of degrees. This was exactly what was expected as the shock pushed into the red giant's wind and slowed down. Then something remarkable and unexpected happened to the X-ray emission. "About a month after the outburst, the X-ray brightness of RS Oph increased very dramatically," explained Dr. Julian Osborne of the University of Leicester. "This was presumably because the hot white dwarf, which is still burning nuclear fuel, then became visible through the red giant's wind. "This new X-ray flux was extremely variable, and we were able to see pulsations which repeat every 35 seconds or so. Although it is very early days, and data are still being taken, one possibility for the variability is that this is due to instability in the nuclear burning rate on the white dwarf." Meanwhile, observatories working at other wavelengths changed their programmes to observe the event. Dr. Tim O'Brien of Jodrell Bank Observatory, who did his PhD thesis work on the 1985 explosion, and Dr. Stewart Eyres of the University of Central Lancashire, lead the team that is securing the most detailed radio observations to date of such an event. "In 1985, we were not able to begin observing RS Oph until nearly three weeks after the outburst, and then with facilities that were far less capable than those available to us today," said Dr. O'Brien. "Both the radio and X-ray observations from the last outburst gave us tantalising glimpses of what was happening as the outburst evolved. In addition, this time, we have developed very much more advanced computer models. The combination of the two now will undoubtedly lead to a greater understanding of the circumstances and consequences of the explosion. "In 2006, our first observations with the UK's MERLIN system were made only four days after the outburst and showed the radio emission to be much brighter than expected," added Dr. Eyres. "Since then it has brightened, faded, then brightened again. With radio telescopes in Europe, North America and Asia now monitoring the event very closely, this is our best chance yet of understanding what is truly going on." Optical observations are also being obtained by many observatories around the globe, including the robotic Liverpool telescope on La Palma. Observations are also being conducted at the longer wavelengths of the infrared part of the spectrum. "For the first time we are able to see the effects of the explosion and its aftermath at infrared wavelengths from space, with NASA's Spitzer Space Telescope," said Professor Nye Evans of Keele University, who heads the infrared follow-up team. "Meanwhile, the observations we have already obtained from the ground, from the United Kingdom Infrared telescope on the summit of Mauna Kea in Hawaii, already far surpass the data we had during the 1985 eruption. "The shocked red giant wind and the material ejected in the explosion give rise to emission not only at X-ray, optical and radio wavelengths, but also in the infrared, via coronal lines (so-called because they are prominent in the Sun's very hot corona). These will be crucial in determining the abundances of the elements in the material ejected in the explosion and in confirming the temperature of the hot gas." 26 February 2006 was a highlight of the observational campaign. In what must surely be a unique event, four space satellites, plus radio observatories around the globe, observed RS Oph on the same day. "This star could not have exploded at a better time for international ground and space based studies of an event which has been changing every time we look at it," said Professor Sumner Starrfield of Arizona State University, who heads the U.S. side of the collaboration. "We are all very excited and exchanging many emails every day trying to understand what is happening on that day and then predict the behaviour on the next." What is apparent is that RS Oph is behaving like a "Type II" supernova remnant. Type II supernovae represent the catastrophic death of a star at least 8 times the mass of the Sun. They also eject very high velocity material which interacts with their surroundings. However, the full evolution of a supernova remnant takes tens of thousands of years. In RS Oph, this evolution is literally occurring before our eyes, around 100,000 times faster. "In the 2006 outburst of RS Oph, we have a unique opportunity of understanding much more fully such things as runaway thermonuclear explosions and the end-points of the evolution of stars," said Professor Bode. "With the observational tools now at our disposal, our efforts 21 years ago look rather primitive by comparison."